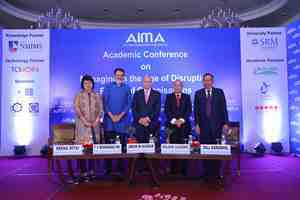 The age of disruption is redefining management best practices and benchmarks, and companies are trying to become more agile than massive, stated experts at the two-day Academic Conference organised by the All India Management Association (AIMA). Reputed professors from top B-schools and leaders from the technology sector focussed on management research and industry-academia integration in the age of disruption at the conference. According to Pai, management education is ripe for disruption. “All the education content is available on the web and there is not much that a professor can tell a student which he or she cannot know by Googling,” he says. He also emphasised upon the need for reduction in the duration and cost of the courses which must reflect the multi-dimensional changes occurring everywhere, especially in manufacturing, energy, banking, education and healthcare sectors. M Arun M Kumar, chairman, KPMG India, sees a growing preference among companies to become fluid and adaptive. “Clients are looking for solutions to complex problems and nobody has all the answers and that is forcing a shift from silos to network-based organisations,” he said. Kumar finds that the management best practices and benchmarks have to be customised to suit client’s needs. He also pointed out that the millennials want more control of their work and time which has impacted organisational structure and behaviour. Kumar believes that the B-schools have to align with the new reality of technology and business. Professor Rajan Saxena, vice chancellor, Narsee Monjee Institute of Management, opined ‘instant response’ is the way to go for companies because of instant market feedbacks. Academics and industry executives also presented their research papers at the meet.